Craving sushi? It's last call for Ginza, a River North gem where “the fish does all the talking.” The restaurant will close down indefinitely in a week. Ginza Japanese Restaurant has been a go-to establishment of mine for two and a half years, although I can’t remember how the relationship started—a friend’s recommendation, maybe, or just a lucky break? Honestly, it doesn’t matter much anymore. When it comes down to it, I’m just glad it’s waiting there, tucked away into the dilapidated Tokyo Hotel, where it has been for 26 years. Yet even two and a half decades of staying power cannot fend off the slogging development of real estate investors. It’s been a few weeks now since I learned that the Tokyo Hotel will be closed and renovated, and Ginza ousted in the process. I recently confirmed with the establishment: Yes, they’re closing. Plans are being discussed to relocate nearby, but the follow-through on that idea remains shrouded in ambiguity. October 26 is the restaurant’s final day of operation, possibly for a short while, perhaps forever. Ginza’s imminent closure irks me. Part of this is the personal sadness of losing something familiar and constant. As Frank Bruni wrote recently in The New York Times, a regular is a regular “for the solace. The peace.” But with Ginza there is a bit more to it than that, because the connection is not only personal but also civic. There is an incubated community in this small basement-like interior, the child of the blazing energy of River North and the aging clientele that dines here. It is worth experiencing during its final days on the culinary circuit. At Ginza, the fish does all the talking, uncluttered by the bandaging of sweet and sour sauces that might otherwise compensate for lackluster meat. A chirashi box at Ginza ($18.50) will welcome you with a bed of sticky sushi rice sprinkled with seaweed and topped with pickled daikon, radish, ginger, wasabi, and an array of sashimi pieces. 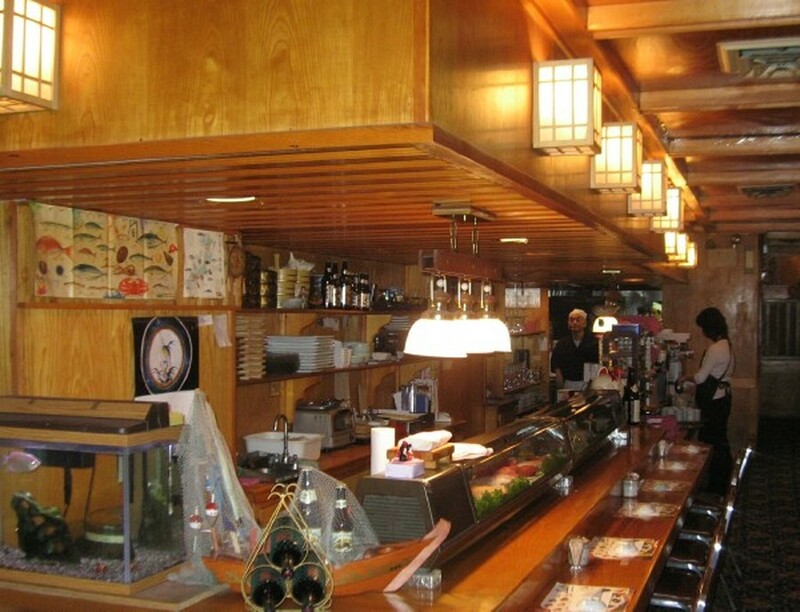 There are staples here—tuna, salmon, shrimp, and salmon roe have always made appearances. That said, each box also comes with a few seasonal treasures for the adventurous bunch—monkfish liver and fresh clam are two longed-for favorites. The deep red tuna is bold yet simple, the salmon is rich in its fattiness yet soft, and the gold-colored smelt roe pops in your mouth and almost instinctively forces a smile. Each piece of fish is delicate and playful under the sumptuous array of colors that glisten in their textured layers: This is where years of experience at the hands of a master craftsman really shine. Ordering nigiri or maki rolls is equally commendable, but as a word of caution, be mindful of how you consume the limited morsels. Every nigiri is already inlaid with wasabi. Beware the trigger-happy need for soy sauce; the sushi speaks for itself, so let it. For those less interested in raw fish, there are still several items that are quintessentially grounded in the restaurant’s suave simplicity. The tonkotsu ramen ($10.50) is served in a metal pot with the broth still boiling, which cooks the ingredients from the inside. This dish produces a balancing act between being boisterous and detailed. The broth is salty and heavy, inlaid with pieces of shrimp tempura and a large clam. Fish cakes, an egg, and green onion smooth out the dish, allowing some of the more subtle textures to come through. The dish is as much about the feel as it is about the flavors. There are many other items at Ginza to look into, some that I’d describe favorably, and others not so much. Consider the yellowtail collar for its tender shards of meat; avoid the fermented soybeans. But in this particular case, the rapidly diminishing lifespan of the restaurant calls more for praise than for criticism. Ginza has hosted more great meals than I can count, and the fact that I have, at times, ordered so much to give the waitress pause is something I’ll remember with both fondness and dread. As far as Chicago’s landmark establishments go, this is one of the most humble and the most honest. It’s a noble existence in a terrain dominated by a food culture that changes every nanosecond. Ginza is worth going to once because it is a unique world within the city, built over years of patronage in a low-profile existence. The restaurant is not the only one in the city that produces complex food out of a careful selection of high-quality ingredients, but it may be the only place (at least downtown) where the world simply melts away in the process. Like a diamond in the rough, Ginza is an undiscovered creation built from the chaotic pressure on top of it. Take some time off next week and go, if only to claim you are an observer of the secret Japanese world concealed in River North that is coming to a conclusion.